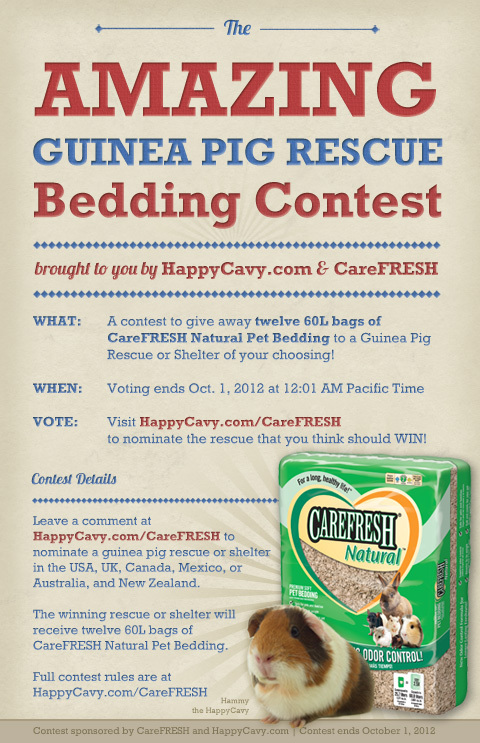 Do you know of a guinea pig rescue or shelter that could use some free Carefresh bedding? Our friends over at HappyCavy (known for their fun live streaming guinea pig webcams) asked us to help spread the word about a contest they are hosting to benefit guinea pig rescues and shelters. The winning rescue will receive twelve 60L bags of Carefresh bedding! 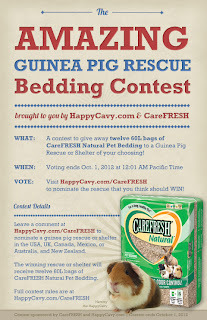 To cast your vote, please head over to the HappyCavy.com/CareFRESH contest page and nominate your favorite shelter. The voting ends October 1, 2012 so get your vote in and spread the word!